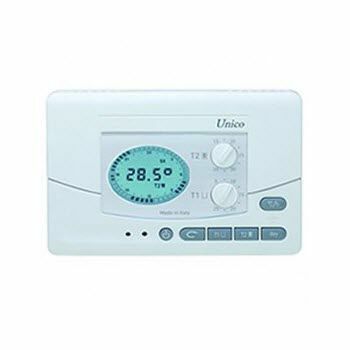 "UNICO" is a daily and weekly electronic chronothermostat with two temperatures that can be set in hour interval. "UNICO" can be wall mounted or installed on a 503 wall box. 1/2 hour segment on - temp. max. 1/2 hour segment off - temp. min.